Many thanks to Great Clips for sponsoring today’s post, but my love for supporting teachers is all my own! As a mama to a 5 year old, the topic of school always pops up in our day to day operations. I've planned to homeschool our son from nearly day 1 and just like most teachers prepping for the school year, so am I. I'm feeling the crunch to prepare for the school season as summer quickly passes by. I've gathered a great collection of resources (I may share that down the road if you'd like) and I've been searching for the best curriculum to fit my son's learning style. I've read tons of reviews, done my research, taken notes, made lists, purchased supplies, etc; and I still feel like there is more that I need to get. Just like teachers, you feel like you don't have everything you'd like and that there is so much more you'd like to add in. Today I'm happy to partner with Great Clips and their wonderful initiative to help teachers. Currently they're running a #GREATLIST contest as well as an "Adopt A Classroom" donation funding help to teachers in the classroom so they can get what they need. 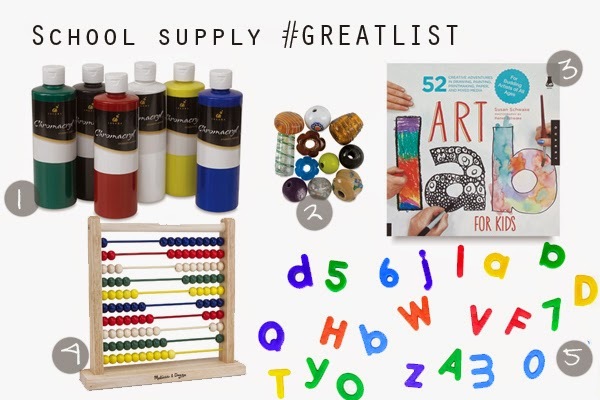 By visiting the -->#GREATLIST page <---, you can watch the classroom makeover video, enter the #GREATLIST contest (for a chance win your supplies list!) and download the online check-in app which will donate to the Adopt-A-Classroom fund! Our list is below -- upload yours too, and then cross your fingers everyone! As well as these fabulous offers, many Great Clips are offering back-to-school pricing for haircuts! Check out your local Great Clips for more details. If you have homeschooling tips, school supply tips or any back-to-school tips -- we'd love to hear them! I am loving the GREATLIST program! We use or magnetic letters all the time. A must have!